Just when it seems every acclaimed new-wave and post-punk band is coming out of the woodwork to play gigs this year (and why not? 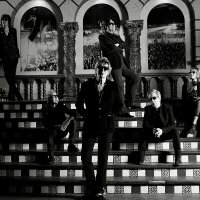 - they urinate all over some of today's pretenders), Richard Butler and The Psychedelic Furs return to their homeland in October to perform one of their classic albums. The band has chosen "Talk Talk Talk", the 1981 set that included their first breakthrough hit, "Pretty in Pink" and the beginnings of a moderately lucrative period (certainly in the States). The dates begin in Frome - yes, Frome in Somerset - at the town's "Cheese and Grain" venue on the 24th Oct (what a coup that is) before continuing to Manchester on the 26th, Birmingham on the 27th, London on the 28th and finally Glasgow on the 29th. Tickets go on sale at 9am on Friday priced at £22.50 plus fees. As well as tracks from "Talk Talk Talk", including "Dumb Waiters", "Mr Jones", "I Wanna Sleep With You" and and "All of this and Nothing", the Furs will also perform an encore set of their other classics which basically means 'take-your-pick' - "Heaven", "President Gas", "Until She Comes", you could pick any era, any album and there are always a few handfuls of gems that spring to mind. Needless to say, the tickets should fly out!